The challenge: "Let's take a look at the view out of your studio, be it through your window, door or imagined window maybe?" I decided to take the opposite approach and instead of looking to the outside from my studio, I chose to look into my studio from my bedroom! My bedroom has French doors to the porch where my studio is located. 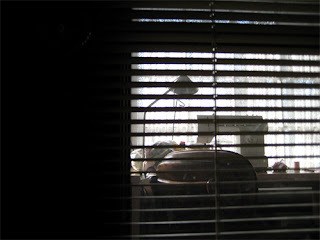 With the blinds open it offers a mysterious back lit ambience. Rather like an "I spy" scenario. 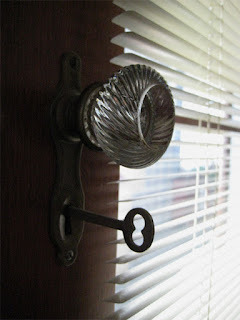 With that in mind, I decided a photo of the old fashioned glass door knob and key/key hole were in order to complete the noir feeling. 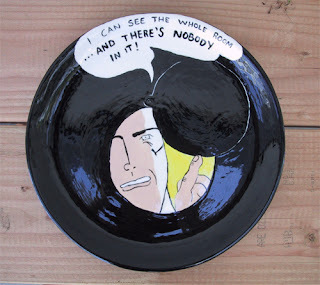 My studio images reminded me of this plate I painted for personal use back in 1999, a copy of Roy Lichtenstein's image called I Can See the Whole Room.